Saturday, May 21 and Sunday, May 22 TokBox will be at the TechCrunch Disrupt Hackathon. Fueled by pizza, beer and RedBull, the hackathon event will begin Saturday afternoon through Sunday morning, May 21st – 22nd. Then after a lightning round of demos and judging Sunday afternoon, the winning team will present onstage at Disrupt on Wednesday, May 25th. This is a great opportunity for superstar hackers to share the spotlight alongside the top startups chosen from Disrupt’s Startup Battlefield. If you’re at the event, stop by our “Getting Started with OpenTok” workshop on Saturday afternoon. 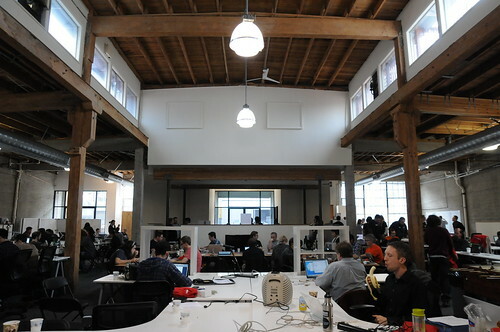 This last weekend we hosted Music Hack Day at our office in San Francisco. As a result of a collaborative effort on behalf of the people at Music Hack Day, the Echo Nest, SoundCloud, Song Kick, the TokBox team, and many others, the event was an astounding success. More than 150 developers showed up to create 55 awesome hacks over the weekend. Music Hack Day @ TokBox HQ. Image provided by Thomas Bonte.